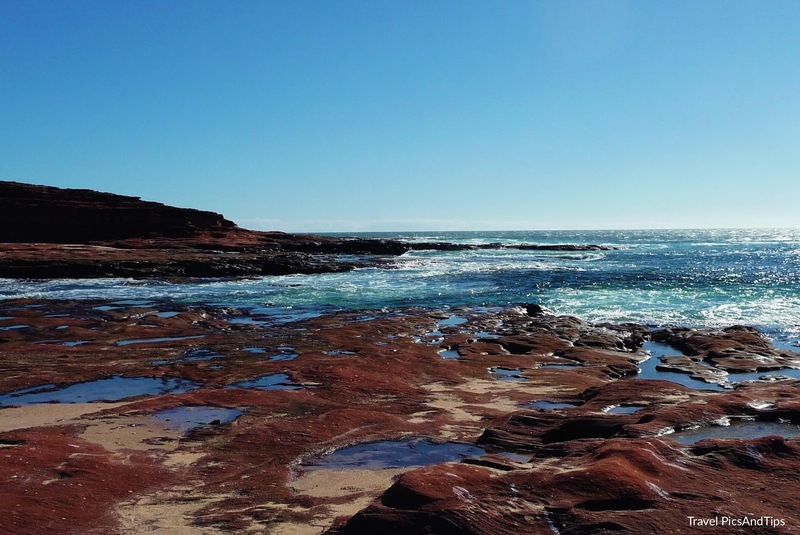 Kalbarri is a wild and beautiful National Park located on the Australia west coast. It offers stunning view on the Murchison river, allow to discover beautiful cliffs and wildlife. I chose to visit it in one day, but you can stay longer if you would like to enjoy beaches and do some challenging hiking. 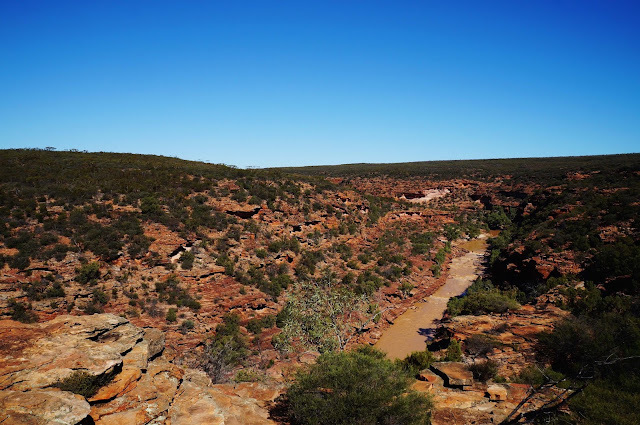 Here is the map I followed with the main lookout and trails from the entrance of the park (see below "you are here") : Hawks Head and Ross Graham through the Ajana Kalbarri road, the go back to the entrance and take the other junction to join Nature's Window and Z Bend site. If you have time, you can then visit the other side on the coast. Near the entrance, the first stop is Hawks Head that offers a nice scenic view (200 meters return) and leads to the Ross Graham lookout with a stunning view on the Murchison river (100m return). 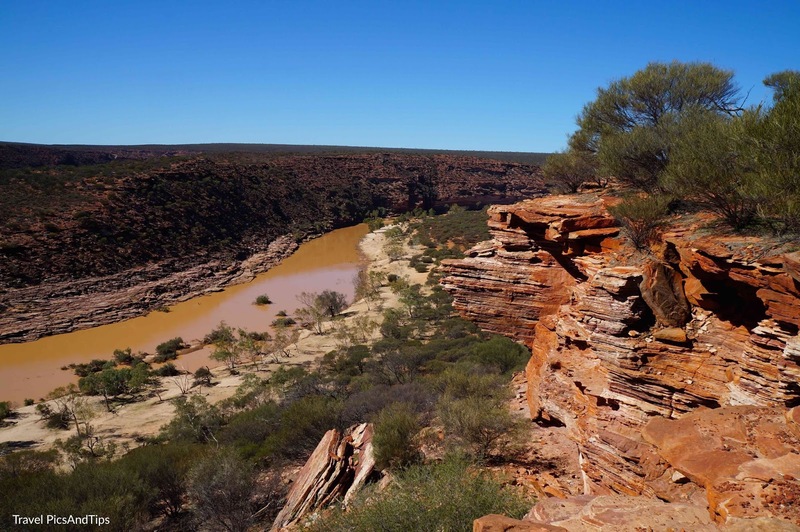 You can also continue down the path a further 250m to reach the peaceful and sandy bed of the Murchison river. Then, visit the gorge of the river (est of the park) and reach the Nature's Window and Z-Bend site. Dirty road on 20kms after the junction. 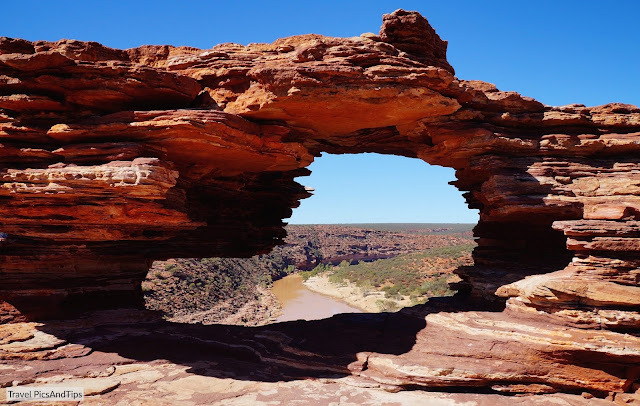 Nature's Window, one of the most lookout, is a natural rock arch that offers a nice view on the Murchison river. 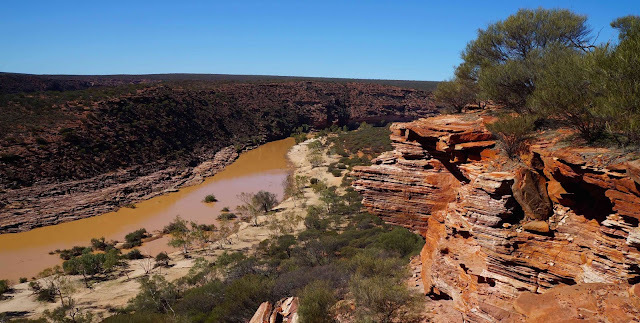 Another great point of view on the Murchison river from the Z-Bend lookout (1,2 km return). You can keep walking on the Gorge Trail (2,6 km return); a demanding walk that explores the gorge's steep sides and the Murchison river. You can finish the tour by the coast, on the top of the cliff, near the city: Pot Alley, Rainbow Valley, Mushroom Rock and Red Bluff.